Watford XI: Gomes, Nyom, Cathcart, Britos, Ake, Capoue, Watson, Abdi, Deeney, Anya, Ighalo. West Ham XI: Adrian, Jenkinson, Collins, Tomkins, Cresswell, Noble, Kouyate, Lanzini, Payet, Moses, Carroll. Right then, that's it from me. But you can follow all the reaction to this match and Saturday's other games over here. A deserved win for Watford. Troy Deeney denied as Carl Jenkinson dashes across goal to clear with his head. The Hammers are still gamely plugging away but that James Collins red really took the stuffing out of them. This one's winding down now. Enner Valencia is played through on goal over the top but handles as he brings it down. Andy Carroll blasts the ball wide in frustration. James Collins is off! A hack at Odion Ighalo! Surely that is it now, and James Tomkins picks up a yellow for dissent too. Big cheer from the home fans as Troy Deeney tracks back to win the ball in defence. Are they home and hosed? Is there a way back for West Ham? Was Enner Valencia's moment the one that could have changed the game? Since he hit the post the away side haven't come close really. Two changes.Almen Abdi is off for Valon Behrami for Watford. The final one for West Ham sees Mark Noble coming off for Nikica Jelavic. This time it's fantastic defending from Craig Cathcart! With Andy Carroll right on him, he clears Carl Jenkinson's dazzling cross from practically under his own bar. From the corner, Heurelho Gomes claims. What a chance! What a let-off! Craig Cathcart is in the bar already, juggling the ball around before playing a backpass that's intercepted by Enner Valencia. The West Ham striker crashes the ball against the post! And Andy Carroll can't make anything of the rebound. A change for Watford now. Ikechi Anya is off. He's run his race very quickly indeed today. With just under 25 to play Juan Carlos Paredes is his defensive replacement. Allan Nyom goes into the book for a foul on Enner Valencia, clipped him down with the Ecuadorian approaching full stride. Still though, West Ham are starting to state their case a bit more here. They were quiet as a shrinking shrew that opening 45, but since going two behind (and surviving that ridiculous five-minute onslaught after Ighalo's second) they've at least been a bit brighter. Dmitri Payet whips in a cross, Allan Nyom steers comfortably clear, but Enner Valencia wants a penalty for the challenge under Etienne Capoue... in truth there's nothing in it. Oh, Andy Carroll, you are not Marco van Basten. Think Euro '88 volley from that angle. That's probably what flashed through Carroll's mind, but instead of searing top volley drama we've got a floppy bobble, skuffed off the flank of his shoe. Etienne Capoue sends us all with a dummy that's actually a pass into Troy Deeney, the striker flicks on gracefully (well, gracefully for Deeney) but Almen Abdi spoils the party by firing over Adrian's bar. What is Slaven Bilic thinking now? He's seen his side go 2-0 behind almost straight away after making those two half-time substitutions. There really doesn't look like any way back for the Hammers from here. "That's the confidence of a striker who has scored a goal in the first half. I looked at this game for West Ham and thought, sitting third in the table, they were expected to win it, but there has been a little bit of complacency." Ikechi Anya is so rapid! He burns a path down the West Ham left, finds Odio Ighalo with a deep cross but West Ham recover in numbers. They are rattled here, the Hammers. They need goals, they need to pour forward, but they know Anya is such a threat on the counter. 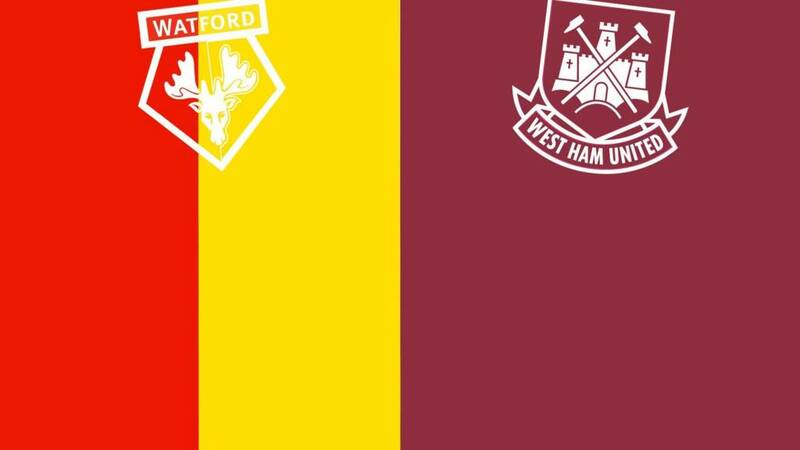 My, oh my, Watford are all over West Ham here! Troy Deeney with an abysmal finish though - the goal was at his mercy with the ball on the edge of the box. What was that? Prodded, over? He just stumbled into the ball! And Ighalo should have a third! Adrian saves down low as the Watford striker goes for a placed finish. No disputing this one! Odion Ighalo doubles Watford's lead right after the break! Lovely through ball from Troy Deeny to Ikechi Anya who squares for a simple finish. Back under way at Vicarage Road then. There's been a double change for West Ham. Enner Valencia and Mauro Zarate are on, with Manuel Lanzini and Victor Moses off. Right then, I'm blaming a dodgy angle for this but it's Odion Igahlo's goal - the Watford striker got a touch. His celebration might have been a tell-tale sign. Of the 'wheeled away in delight' variety. A striker wouldn't lie now, would they? Just the one minute added on ends with Watford pressing West Ham further back on the ropes. The Hammers have their work to do. Well it seems like everybody apart from me has given that goal to Odion Ighalo. I've seen a few replays since and it really did look like Aaron Cresswell turned it in sliding ahead of the Watford striker. Certainly worth another look to see if Ighalo got a touch - he'll not turn it down! "I don't know what he was thinking? Just put your foot through it, get rid or put it out for a corner, anything. Ighalo was bright enough to anticipate it, but it's a dreadful mistake. I think he's tried a Cruyff turn in his own box, never do that." Slaven Bilic is not going to be a happy man in that West Ham dressing room. His team haven't turned up and have gone a goal behind in highly ridiculous circumstances. Well Watford deserve it but this is bizarre! West Ham hit the self-destruct button as Odion Ighalo turns in a Nathan Ake cross. At first glance it looked like an Aaron Cresswell own goal, but after several replays, it's the big man's. Ake had nicked the ball off Andy Carroll dallying in his own penalty box. Silliness! Comes to nothing though, Almen Abdi fluffs his lines. In fairness the ball wasn't great. Watford with another penalty claim - they think James Collins handled, but either way it was outside the box. Adrian then denies Odion Ighalo from a tight angle. Straight at him. But that's yet another shot to stop. West Ham haven't hit the target yet. By the way, Kouyate's been waved back on, he's fine. Cheikhou Kouyate goes down after a challenge with Miguel Britos in the air. Looks OK, but the West Ham physios are on taking a look. Ikechi Anya's been the closest to West Ham's goal so far - his average position's pretty much been that of a striker judging by the graphic below. The midfielder's been running through the lines, and looks a real threat playing off Odion Ighalo and Troy Deeney. Oooh! That should have been a lot closer. Miguel Britos hammers over with a header off a Ben Watson free kick. He had loads of space, rose really well, but no dice. Victor Moses is always a threat with his pace though - played in by Andy Caroll, his only hope is to run it alone from a tight angle, two defenders covering. He was probably running too fast - seemed to lose his balance as he let fly, his shot dribbles across goal. West Ham fading a bit here. Watford are finding spaces between the lines - Akechi Anya in particular with some brilliant dribbling through the middle just now. Troy Deeney and Odion Ighalo yet to find that telling combination though. Andy Carroll's been a bit isolated for the Hammers. The ball's mostly been with the away side so far, but it's Watford who've come closest to scoring through Nathan Ake's header. Don't do it James Tomkins! Bit of a risky back pass to the 'keeper almost plays Odio Ighalo in. Just about safe though. Did he know he was there? Now then, West Ham are taking a step back for a moment here, looking to slow Watford's momentum with a few careful passes at the back. As soon as it comes beyond the halfway line the home side are on to them though, great pressing to win it back. Down the other end, Watford go so close to opening the scoring! Nathan Ake has a header from a corner saved by Adrian, Odion Ighalo is following in but can't connect, Troy Deeney does but his shot is blocked by Andy Carroll. Victor Moses was offside anyway so it doesn't really matter but still - Watford were exposed far too easily there. Dmitri Payet spins away from Ben Watson and with one pass Moses was in. The flag was up though, and his touch was awful. And here's Watford's best move so far. Allan Nyom with a cross to the back stick, Troy Deeney is lurking, his cut-back ricochets to the edge of the box but West Ham can rally to clear. Beautiful little trick in midfield to spin away into space - a 360 roulette if you will - but his low shot has no power. Easily gathered. Last season there were very few better strike partnerships than Watford's Troy Deeney and Odion Ighalo. The home side knocking the ball around at the back before the inevtiable hook up field, looking for that combination to spark again. Here we go then, we are under way at Vicarage Road. Will the Hammers slip up? Quote Message: West Ham have started the season brilliantly, but this game concerns me, because the expectancy is that they will win. West Ham’s biggest asset has been a respectful fear of the opposition or being the underdog, but going into this they are expected to win and it could be a banana skin. West Ham have started the season brilliantly, but this game concerns me, because the expectancy is that they will win. West Ham’s biggest asset has been a respectful fear of the opposition or being the underdog, but going into this they are expected to win and it could be a banana skin. Quote Message: West Ham are such a threat on break, Dimitri Payet pulls the strings and Manuel Lanzini has been a revelation. There is real talent in the side, and there is nothing wrong with being organised - they don’t mind letting the opposition have the ball and then hitting them on the break. West Ham are such a threat on break, Dimitri Payet pulls the strings and Manuel Lanzini has been a revelation. There is real talent in the side, and there is nothing wrong with being organised - they don’t mind letting the opposition have the ball and then hitting them on the break. "If you look only at Watford's miserable home record and West Ham's superb away form then you'll quickly mark this down as a Hammers win. I would have done too before Watford's victory at Stoke. "There I saw three unexpected points claimed by the impressive team ethic. They have no stars. Instead, working unselfishly, they are clearly determined to try to survive amidst the Premier League's glamour. "Usually, West Ham are among the also-rans. But look at the table. Think of their superb away wins this season and their Chelsea victory last weekend. "I find both clubs refreshing. I hope to relish this game. No, I don't know who's going to win." A tale of two strikers? Will today just be a tale of two strikers? Watford head coach Quique Sanchez Flores: "For me, at this moment, Troy Deeney is really good. From the first moment in this league he played like a striker. "Now he is settled, he has put in good performances. His impact on the team is very important." West Ham manager Slaven Bilic on Andy Carroll: "His quality, as I said 20 times, was never an issue. When he is fit he is capable of everything. "We are good in the air without Carroll - we have Diafra Sakho and Nikica Jelavic who are good in the air. But he is maybe the best in England - definitely when he is fit. "If the good balls come in an area where he is, it is almost impossible to mark him." Watford manager Quique Flores names an unchanged starting eleven from the team that beat Stoke 2-0 last weekend. West Ham manager Slaven Bilic makes two changes to the team that beat Chelsea 2-1 last weekend. Diafra Sahko and Mauro Zarare drop out, while Andy Carroll - who got the winner against the Blues - and on-loan forward Victor Moses, who was ineligible against his parent club, return. In fact, maybe you could tell us? Don't forget you can predict the outcome of the weekend's matches using the BBC Sport Predictor here. What kind of a game are we in for today then? Can West Ham continue their big-match form (how about beating Chelsea, Man City, Arsenal and Liverpool so far) against Watford? Or will Quique Flores's side pick up a second win on the bounce, following last weekend's win at Stoke? Good afternoon, welcome. I trust the water runs freely down your mountain.